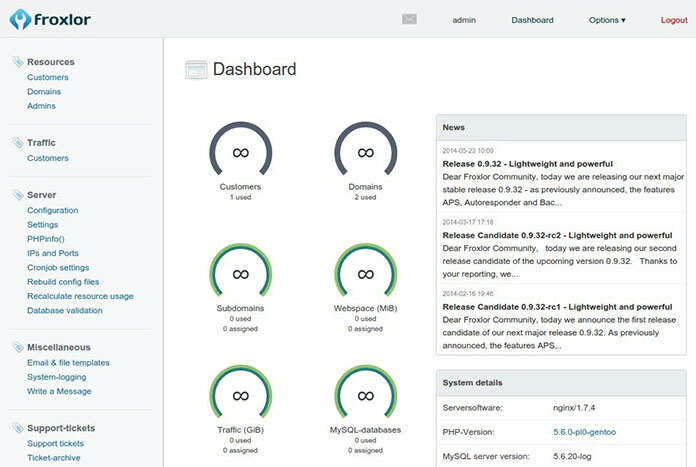 Froxlor is an open-source web control panel with a very clean interface. There is IPv6 support, a ticketing system, and an integrated reseller-customer messaging system. It is ideal for ISPs and similar organizations. Choose per domain which IPv4 and/or IPv6 addresses and which ports should be used. Determine which ports should use SSL and allow customers to store certificates per domain. Save different PHP-configurations and choose per domain which php.ini should be used (FCGI/FPM only). 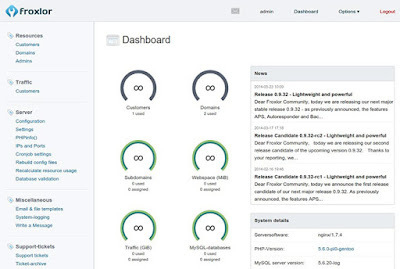 Manage reseller ressources and limit what the customers may use in the dedicated customerpanel. Store dedicated HTTP, FTP and Mail traffic and view it in interactive graphs. Allow your customers to create support tickets and reply directly within Froxlor - with online/offline indictator for the customers. Style froxlor by overwriting the basis CSS or create your complete own theme. Use free certificates from Let's Encrypt directly from within froxlor.